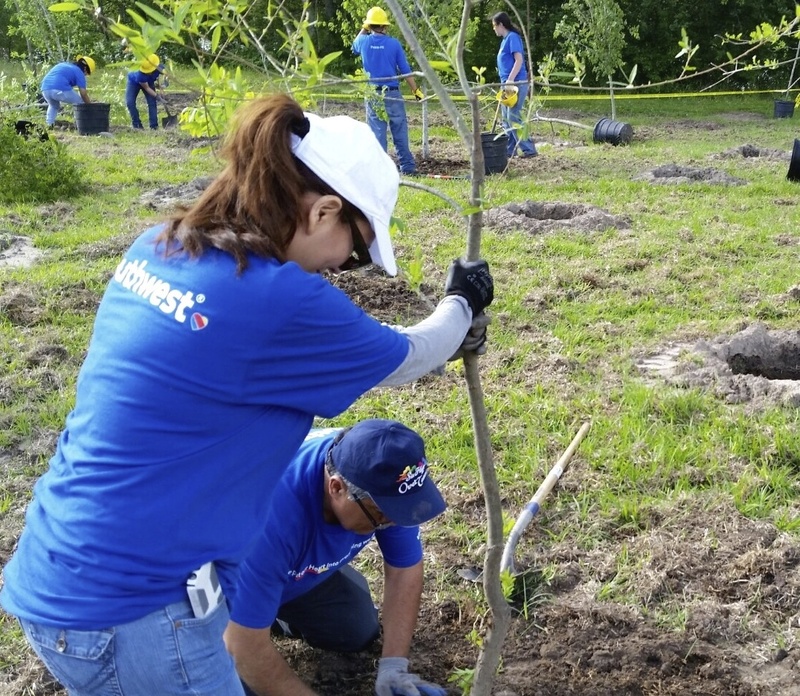 With the support of Earth Day sponsors American Express and Southwest Airlines, SCA brought together over 2400 volunteers nationwide to celebrate the planet through service. At 14 SCA Earth Day events across 10 cities, thousands of volunteers joined forces to honor the 47th Annual Earth Day and make a hands-on contribution to their local parks. 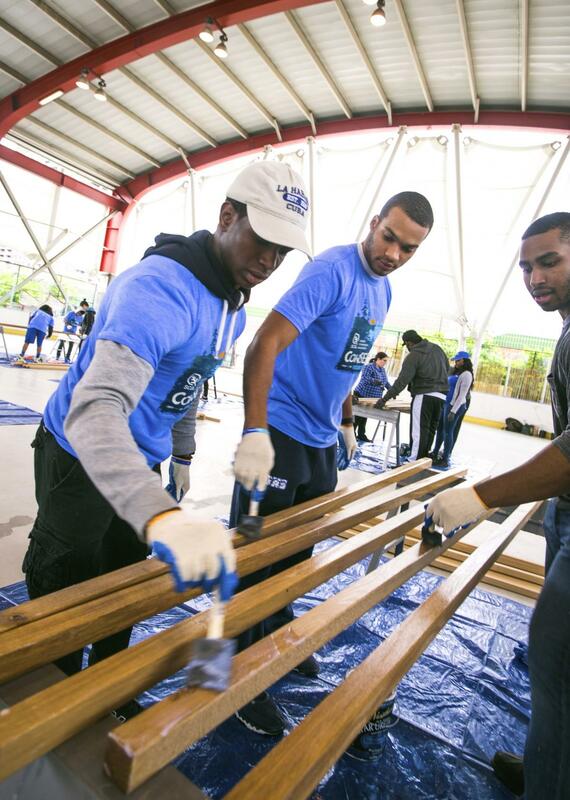 In New York City, SCA teamed up with New York State Parks, NYC Parks, and Trinity Cemetery to hold a community Earth Day festival and service event in Harlem. Volunteers deployed across four park sites to prep wood for new park benches, conduct visitor surveys, and gather historic data from memorials. Hundreds more families and local community members stopped by SCA’s Earth Day festival at Riverbank State Park to make native wildﬂower seed bombs, challenge friends to the Recycle Relay or Decomposition Derby, enjoy music from Urban Radio 103.9 and student band The Beacons, and pick up a free tree courtesy of the New York Restoration Project. SCA partnered with Care To Recycle®, a program of Johnson and Johnson Family of Companies, to offer recycling-themed giveaways and invite participants to bring empty toilet paper tubes to transform into biodegradeable seed starters. Care To Recycle® also hosted a photo booth at the event to spread the word about the Donate a Photo campaign, through which Johnson & Johnson will donate $1* to SCA for every photo uploaded through the Donate A Photo app through June 15th. 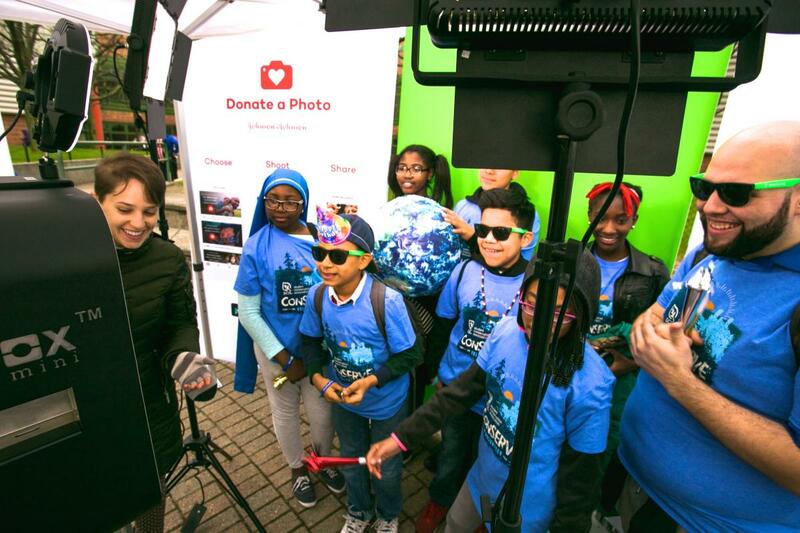 Dozens of participants lined up to snap pics with iconic parks backdrops, message boards, and Earth Day props and donate their photos for the planet. In all, more than 750 participants joined the New York celebrations. New York State Parks Commissioner Rose Harvey welcomed volunteers, highlighting the expanding partnership between SCA and State Parks across programs including SCA’s Hudson Valley Corps, SCA’s Excelsior Conservation Corps, and (new this year) SCA’s New York State Parks Corps and high school community crews working at State Parks sites. Elsewhere across the country, SCA boosted other regional partnerships with events from San Francisco to DC. 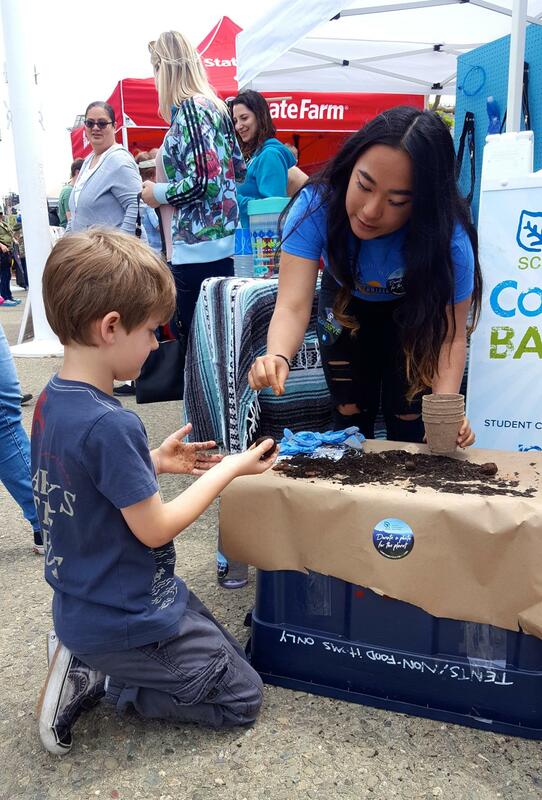 On the west coast, SCA hosted quick-touch service activities at the Earth Day San Francisco festival, attracting over 700 participants to make seed bombs and seed starters out of recycled materials as part of the citywide celebration. In Seattle, more than 300 SCA volunteers came together to mulch gardens at the Washington Park Arboretum, while in Houston 75 volunteers came out to plant 300 trees at Sims Bayou. In Philadelphia, 70 volunteers participated in the annual Darby Creek Cleanup at John Heinz National Wildlife Refuge. And up and down the Hudson Valley and in New England, members of SCA residential corps programs came out to serve at smaller regional projects. 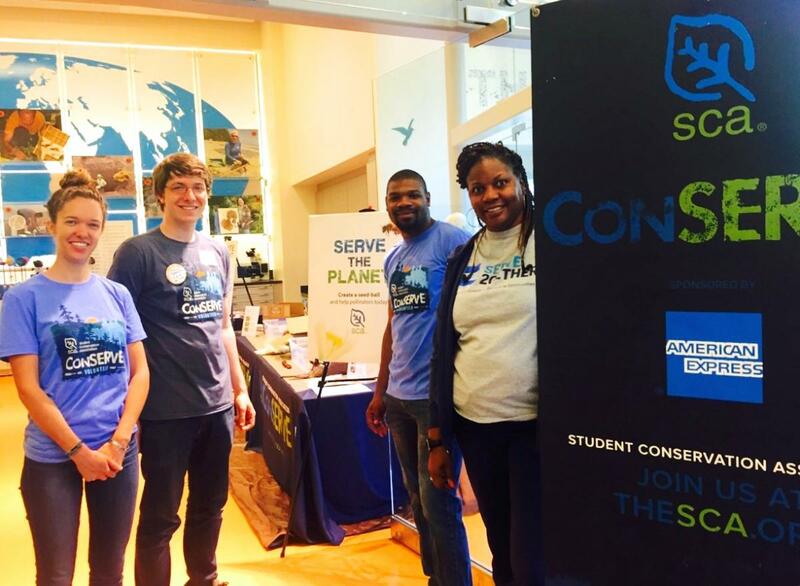 SCA also mobilized Earth Day preview activities in Los Angeles and New York City, bringing quick-touch service directly to the oﬃces of local companies to give employee volunteers an opportunity to get involved. 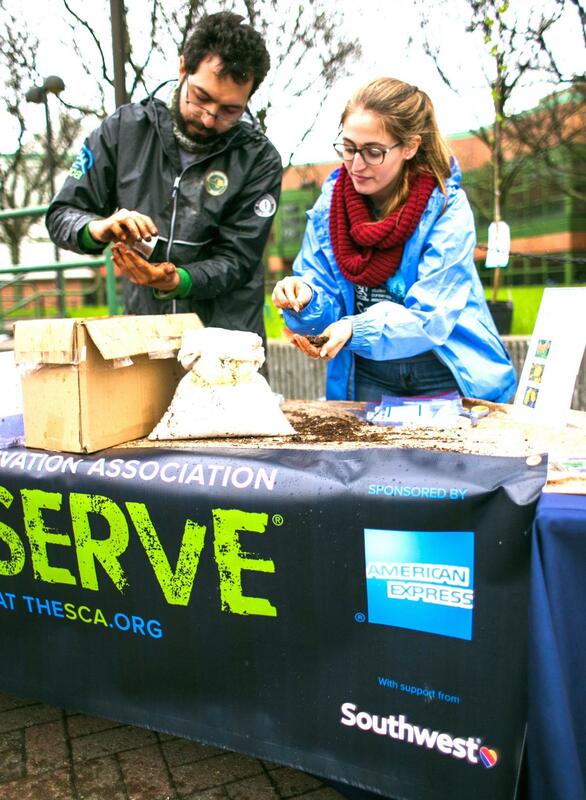 At American Express and Cohen & Steers in NYC, and at Creative Artists Agency in NYC and Hollywood, SCA alumni led hands-on activities making wildﬂower seed bombs and building birdhouses to be donated to New York City Audubon. “We had an awesome time as everyone was able to take a break from the work day and get their hands dirty,” said volunteer Courtney Dover. Special thanks to American Express, Southwest Airlines, and Johnson & Johnson for supporting our events nationwide, and to our project partners New York State Parks, NYC Parks, Trinity Cemetery, and New York Restoration Project in New York City; Smithsonian in Washington DC; Earth Day San Francisco in the Bay Area; Washington Park Arboretum, University of Washington Botanic Gardens, and Seattle Parks & Recreation in Seattle; Houston City Parks and the Texas Commission on Environmental Quality in Houston; John Heinz National Wildlife Refuge in Philadelphia; NYSDEC and Bear Mountain Trailside Museums & Zoo in the Hudson Valley; and NH Audubon in New Hampshire. 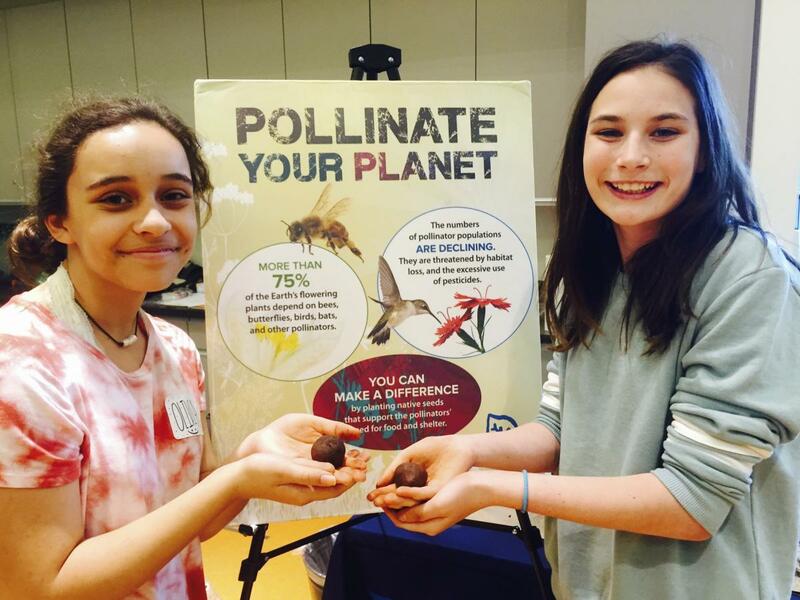 Interested in reading more about SCA Earth Day Events? Check out our Earth Day 2017 Impact Report! See more photos from the NYC Event and DC Event on Facebook and stay tuned at www.thesca.org/conserve for updates on coming events. *Disclosure Statement: Johnson & Johnson has curated a list of trusted causes, and you can donate a photo to one cause, once a day. Each cause will appear in the app until it reaches its goal, or the donation period ends. If the goal isn’t reached, the cause will still get a minimum donation.